Every year I track how many benefit babies there are relative to the total births. Being a 'benefit baby' means relying on a parent or caregiver's benefit by the the end of their birth year. Most will become reliant nearer to their birth date rather than first birthday. Many will go on to experience long-term deprivation. This year I asked for a breakdown by Work and Income Service Centre. That was provided. Then I asked the Ministry of Health for District Health Board birth data for 2015. They very quickly obliged without an OIA. Credit to them. It was then straight forward to place each service centre in a DHB and calculate the percentage of babies in each district that would be benefit-dependent before their first birthday. Tairawhiti is Gisborne northwards. Almost one in three children born in 2015 would be on welfare either immediately or shortly thereafter. This is more than three times the rate of the lowest DHB, Auckland. Lakes covers the Rotorua and Taupo region south to Turangi and Whanganui takes in Marton and Taihape. Hawkes Bay goes to Wairoa in the north and Waipukarau in the south. Counties Manukau is self-explanatory. 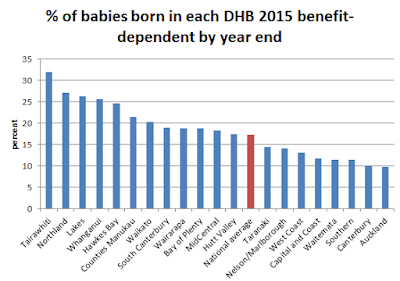 These then are the five DHB areas where from 21 to 32 percent of newborns have families unable to support them independently, usually from birth. At the other end are the cosmopolitan centres. In ascending order, Auckland, Christchurch, Dunedin and Wellington. Every South Island DHB - bar South Canterbury which is essentially Timaru and inland - is below the national average. Child poverty is largely (though not exclusively) a result of benefit babies. But it isn't as if Gisborne and Northland have suddenly been plunged into a depression and unemployment crisis. In fact employment in these regions is far better than it's been in the past. It isn't as if these babies are on their parent's unemployment benefit. Almost three quarters of benefit babies are on a single parent benefit. There's the nub of the problem. A lack of two committed parents prepared to take financial responsibility for having a child. "Millennials Hate Capitalism Almost as Much as They Hate Socialism"
"When pollsters probe young people further about socialism and capitalism, they tend to find that respondents don't have clear concepts of these economic philosophies. To many millennials, "socialism" doesn't mean a government-managed economy but something like what we have now, only with more subsidized health care, student-loan forgiveness, and mandatory paid parental leave. Millennials were small children, if they were even born yet, when the Soviet Union dissolved. "Socialism" isn't Romania and Yugoslavia but Scandinavia, not Karl Marx and union halls but Bernie Sanders and Twitter."